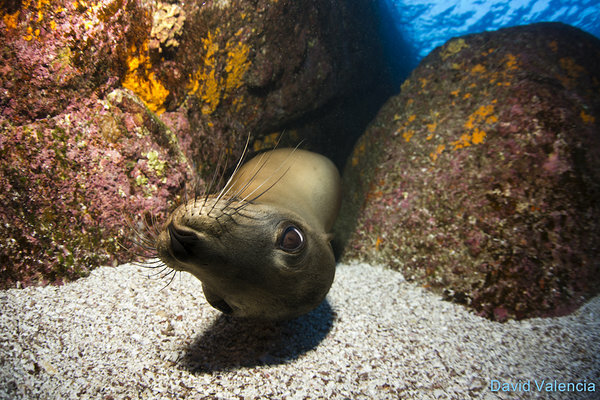 Those big brown eyes stare at you from a distance, then there is a sudden movement as the young sealion darts towards your bubbles and swims through, seemingly having fun as they tickle its body. Mum passed by a few minutes ago but seems content that her child is safe and having fun. Dad is sleeping on the rocks and happy to let mum and pup out of his sight. This is what most people see when they come and visit the sealions at Los Isotes; playful juvenile sealions that are inquisitive about us and seek some kind of interaction, but there is another side to these marine mammals that few think about. Firstly what exactly is a sealion and how is it different to a seal? They are recognizable creatures to young children and those with little knowledge of the ocean, they undoubtably both look adorable, so what's the difference? 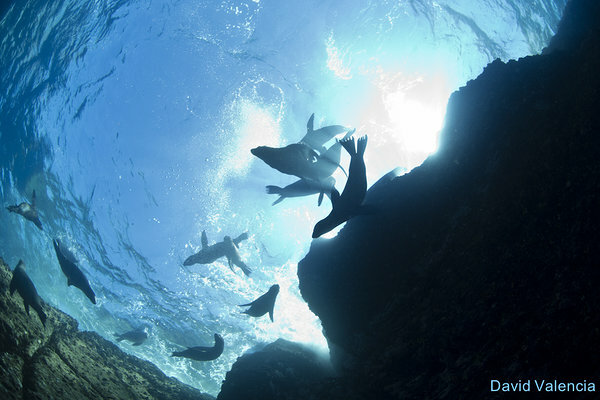 Seals and sealions are both in a group of animals called pinnipedia, which means fin footed. This diverse group includes seals, sealions and walrus and they can be found all over the world from the chilly arctic to the tropical waters of Hawaii! Technically seal can be applied to the whole group but there are differences between a seal and a 'true' seal. Sealions have ear flaps which sets them apart from seals who have ear holes, giving their heads very different appearence. Sealions also have far more elongated front flippers which help to propel them through the water but also make it much easier for them to walk on land. They are much more agile on land than a seal due to the ability to prop themselves up. A sealion also has short claws that are covered by skin on its flippers whereas a seal has much longer claws and fur on those front flippers. Whilst both animals can be social and interactive in the water sealions are overall more social and vocal creatures, they often live in large groups and can be found in large numbers together both in the water and on land, seals are generally more solitary and only group together for mating opportunities. So now that we have established some of the differences, what are you likely to see here around La Paz? Sealions! We have a large number of California Brown Sealions in the area and they are found in two main locations. The first is on a small outcrop close to Balandra Bay and La Paz, this is an area known as San Rafaelito. The population of sealions here is stable and consists mainly of adults, it is not a specific breeding colony. 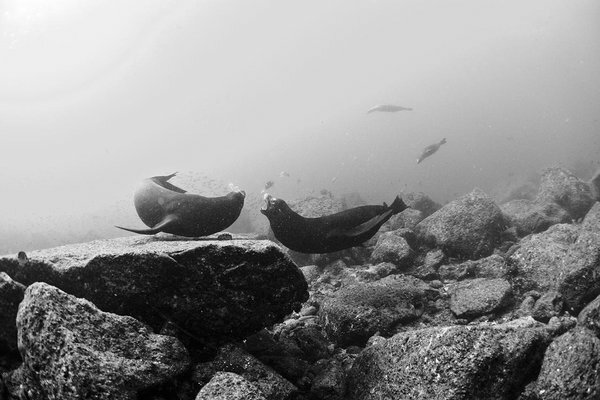 The second population is found at Los Islotes - this is a very well known group of sealions. The number of animals here varies depending on the season but is approximately 400 - 550 individuals. This is a breeding colony and thus we have lots of juveniles who are usually the ones who seek interaction when in the water. The sealions here, whilst wild and unfed/ altered, are used to the boats that visit and seeing people. Sealion parenting and social structure is quite complex - at first the mothers are very protective of their young and keep them out of the water until they have gained some strength and learnt their mothers particular call. After about 10 days the females will leave the pups to go on foraging trips before returning to nurse them. Pups are weaned by one year but some will continue to nurse for another year. The male sealions defend a territory not a group of females. The males with best territory will defend this from other males to ensure the females want to be there. Most of the territory is on land but they do have water territory also, particularly in rocky rather than beachy areas. To try to increase their chances of keeping their territory males will often try to stay on land as much as possible, this means fasting to ensure they are not wasting time hunting, they are able to o this due to a thick layer of blubber that they accumulate over the winter months. So what does this behaviour mean to us as divers, snorkellers and observers? Well this year is the second annual closure of Los Islotes to inwater activity. This year the timeframe has been extended and is from June 1st to August 31st. This is to allow the sealions some peace to give birth and mate but also to avoid any problems bought on by human presence during this delicate timeframe. During the breeding and mating season male sealions can become defensive in order to defend their territory. Whilst not usually aggressive towards humans, if we do not respect their territory then there may be consequences. Overall most of the visitors that go to see the sealions do not have a problem, they respect the national park guidelines which are in place to ensure safe, environmentally friendly interactions for all parties; however there are some operators, private boats and visitors who don’t respect these rules and from there has stemmed problems. Visitors have been bitten by large male sealions – these creatures are not aggressive but they are defending their territory – remember it is both onland and in the water. If an animal bites a human then regardless of the reason then it is likely to get stigmatized and will have a negative impact on how we view them. When the people were bitten by the sealons it is likely (I was not there and do not know the whole story) because they were too close and did not heed the warning signs that it gave to show it wasn’t comfortable with their presence. The juvenile sealions are best described as being like puppies because of their playful nature and are unlikely to cause you any issues other than some over enthusiastic nibbles! 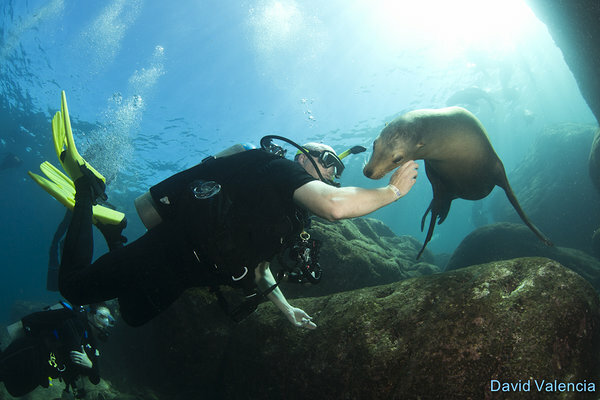 I think it is a great that the Environmental agencies here in La Paz are closing the sealion colony during this time – it receives a lot of visitors throughout the year and it is good to let the sealions have a break but also the fish and coral population too. Although there are mooring balls to use so boats don’t drop anchor on the reef the number of people going in the water can be damaging in itself – especially if they all wear oily sunscreens (see one of my earlier posts for reasons on this). It also forces tour operators to forgo the cookie cutter experiences and seek other places around the island. For us this is not a problem, we are used to taking our time and exploring all the different beaches, snorkel spots and trails. The sealions will be waiting for us again in September with many new young juvenilles to coo over. Remember all the animal encounters around La Paz are natural and as such cannot be guaranteed but there is always stunning scenery and sealife to be found. Photos by my good friend and phtographer Dave Valencia.